This gorgeous blue color is so flattering on so many complexions. At least 3 people told me, "Your eyes look SO BLUE." I tried on this dress and it fit so well, too. 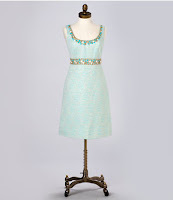 I love the beading and detail on the neckline; it's just right. Not too over the top, but super elegant. You'll get a million compliments on this one. So when I saw this dress on the hanger, I didn't think that it looked like something that would be on my must have list. After I tried it on, I knew that I had to have it. 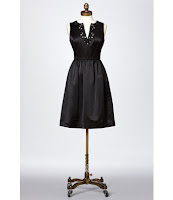 It's the perfect black dress that works with almost any formal or semi-formal occasion. Words can't describe how truly Audrey Hepburn-esque this dress is. Reminds me of something that I would wear to a Soiree with Lester Lanin music. I'm still looking through old boxes from college for my Lester Lanin beanie, but I won't digress. . . Yesterday, someone was asking about tights with formal dresses. Personally, even if I am going to freeze, I hate to wear pantyhose or tights with dressy dresses like Sidra and Kaya. Even though I can't get over the "white after Labor Day thing" and bring myself to break all of the rules, I proudly wear my open toed shoes all year long. Shopafrolic is a great blog that I found after reading about it on the Lilly website. Jane and Liz from Shopafrolic both agree that bare legs and sandals are a "DO" all year, too! Let me know in the comments what you think! Do you wear open toed shoes all year? What are you going to wear this New Year's Eve? Wishing everyone the best for 2010 and a very happy New Year's Eve! I LOVE that black Kaya and rock open toes and white jeans all year long! @Pink Maple and @PoshMomma Thanks for reading! Audrey Hepburn is my ultimate fashion icon. I know what you mean about open toes to boots. . . there's no in between for me! Easy & impressive chocolate treat! Thrifty Thursday ~ Sales every day! Stocking stuffers for little girls! Riding the Lilly Jeep in the Parade! Thank you notes now and all year long. . .